Another one SOLD with multiple offers! Move-in ready home with 4200 square feet, 5 bedrooms & a flex room, a finished basement, and a 40x20 gunite pool, all on a private .81 acre yard that backs up to wooded area! 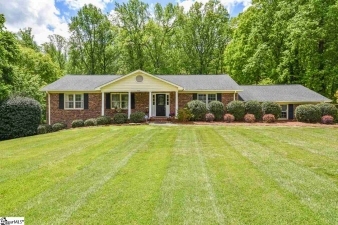 Located in a prime location in Simpsonville, this beautiful brick ranch offers so much home with so many features. The main level offers a large formal dining room and living room, plus a huge (~28x20), bright sunroom, right off the kitchen, that overlooks your private, wooded backyard. The finished, walk-out basement features an additional 2 bedrooms and a full bath, plus a large rec room and another flex room that is ideal for storage or multiple other possibilities. Outside a huge patio overlooks your in-ground gunite pool, and behind the fenced area you have more yard that backs up to woods and a small creek. Hardwood floors throughout the main level, new carpet in the basement, a deck off the sunroom that leads down to the pool area, a security system, and so much more! Don't delay - make an appointment to see this home today!